Should you compare the SNES controller to the original 3 button MegaDrive Controller or the updated 6 button one? You are here: Home / Retro Gaming / Should you compare the SNES controller to the original 3 button MegaDrive Controller or the updated 6 button one? Last week I participated in a discussion over at DigitPress. The thread started off talking about what people thought was better: the SNES or the MegaDrive (Sega Genesis); however the argument changed direction nearer the end with myself and a few others debating over which console had the best controller. I liked the original 3 button MegaDrive controller. It was larger than the SNES and NES controllers and fit comfortably in your hand. The Super NES controller was a good controller too. 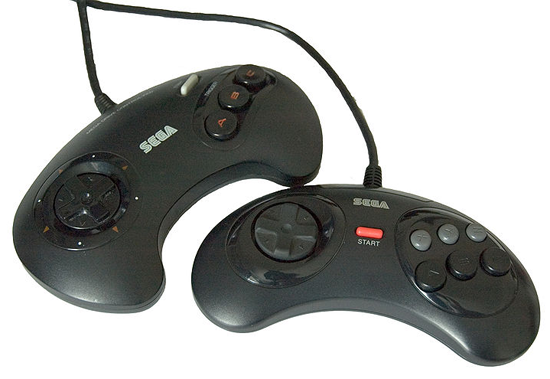 The extra 3 buttons over the Sega controller allowed more functionality in games. True, many games didn’t really require 6 buttons but it came in particularly useful for fighting games like Street Fighter II, Mortal Kombat and Killer Instinct. In 1993, 4 years after the Sega Genesis deputed in North America, Sega released an upgraded official 6 button controller to coincide with the release of Street Fighter 2. 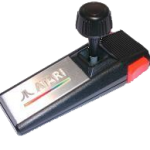 The controller was slightly smaller and featured 3 smaller buttons (X,Y,Z) above the original buttons (A,B,C). Although I did see the new 6 button controller in shops when it was released, I never used it. Therefore I am not able to compare the new 6 button controller to the original 6 button Super NES pad. However, should they be compared anyway? In DigitPress some members believed that it’s fair to compare the upgraded controller to the original Super NES one because it was an official upgrade from Sega. Though I don’t know if it’s right to compare these controllers. The 6 button controller was released 4 years after the console was released in North America and was only released to address the button limitations of the original controller, which wasn’t suitable for fighting games (very few games utilised the additional buttons on offer apart from fighting games such as Street Fighter and Mortal Kombat). 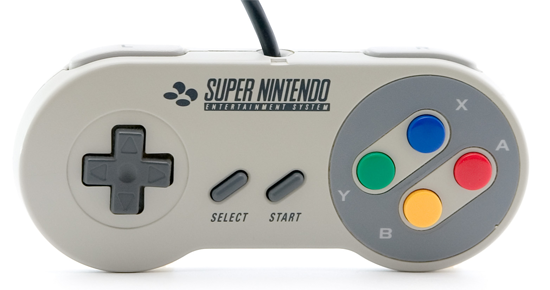 The Super NES had lots of third party controllers released for it though the original official controller was never replaced, so is it fair to compare to it to a controller which was brought out late in a consoles life? I’m of the opinion that it’s not fair to compare them. I believe that if you compare the SNES controller to the Sega MegaDrive one then it should be the original 3 button controller. I do really love the original 3 button Sega joypad. It was perfect for beat em ups like Streets of Rage but it was limited with more advanced fighting 1 on 1 fighting games like Street Fighter II. What do you think: Should you compare the SNES controller to the original 3 button MegaDrive Controller or the updated 6 button one?